Glamping Holiday Gift Vouchers from as little as £20! Looking for the perfect gift for that someone special or just an original present for friends? Maybe you're struggling to find that present for the person who has everything, or fitting the gift to your budget. The one thing we can all do with more of is time and relaxation. So make your life easier and the gift special by using our Glamping Holiday Gift Vouchers! It's easy to give a special gift without breaking the bank. 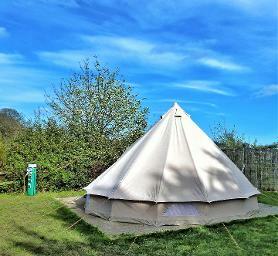 You can purchase Dorset Country Holiday's gift vouchers for any of our glamping accommodation, from as little as £10. Holiday and Glamping break gift vouchers can be used for part or full payment of a Glamping holiday at any time of the year and couldn't be easier to buy. You don't have to pick dates, just the amount you wish. The recipient then chooses when they wish to use their voucher. You can either pay for a full break in specifc accommodation or you can give a voucher of any amount from £10 upwards and the recipient can use this towards payment of their Glamping holiday. There are 3 easy ways to book a gift voucher. Download the glamping voucher form below and email it back to us. You can also tell us if you'd like a voucher sent electronically or in the post and that's it. To use the voucher the recipient just needs to contact us and mention the gift vouchers code when completing the booking form. It's that easy. So why not make someone smile or give them a well deserved break as a special gift. Glamping gift vouchers come complete with an actual glamping voucher via post to present as a gift! Order a glamping gift voucher & we can send your voucher by first class post so you can give it to your recipient. Don't worry if you need it quickly we can still send you an electronic copy of your voucher so you have something you can print out and present to your loved one.